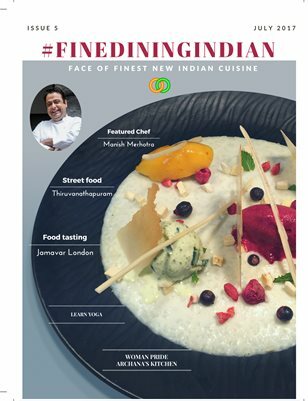 Read and Download Fine dining Indian July Issue 2017. we are very grateful to feature Chef Manish Merhotra, Archana Doshi of Archanas Kitchen, Street food from Thiruvanthapuram, Food Tasting on Jamavar London. Our sincere gratitude to Tandoor-i For being our Prime Sponsor For July which feature Chef Atul kochar as Brand Ambassador. I would personally like to thank My wife supriya premaraj, my cousin Priya and all the esteemed personalities contributed to the magazine. We urge all Indian chefs around the globe to contribute your recipes and articles for our future issues. We are also looking for promoters, through product placement advertisement.